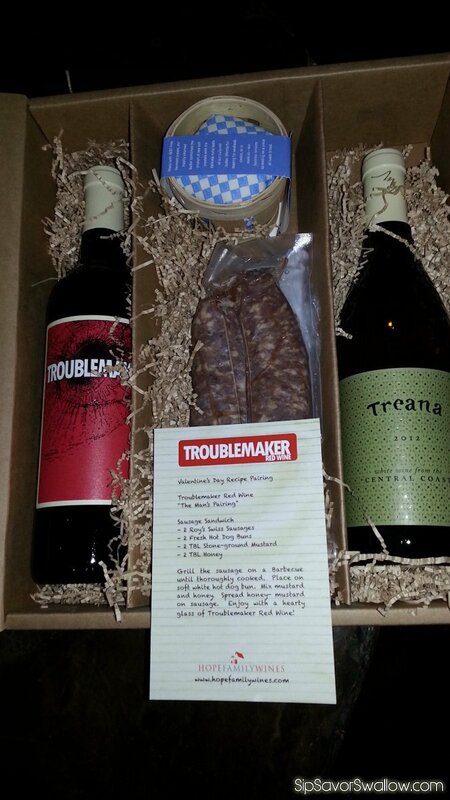 Just in time for Valentine's Day, Hope Family Wines sent out a quirky promotion to lucky little journobloggers like me: a bottle each of their most recent versions of Troublemaker red and Treana white with pairing ingredients to inspire a romantic meal, perhaps. For the red, came two fresh artisanal Swiss sausages (to make the 'Man's Pairing' of sausage sandwiches with honey mustard) and for the white, 6 oz. 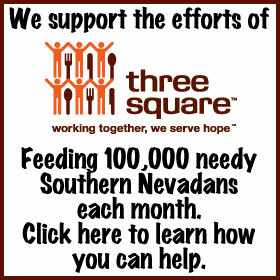 of sea salt Vermont Creamery Butter, along with the "I Aim To Please" recipe of poached salmon and Peruvian mashed potatoes. Not that the acutrements weren't appreciated, but they weren't necessary (I did try the sausage with the Troublemaker, it went nicely of course). Both wines are plenty pleasing by themselves, as you'd expect from Austin Hope, a winemaker who trained under Caymus' Chuck Wagner and eventually bought out his Liberty School label to make Central Coast Cabernet. Hope's family is one of the older grape growers in Paso Robles, and his namesake wine was touted as one of Wine Spectator's 100 best in 2012. Austin and his high school buddy Jason Diefenderfer make smart, individualist wines without crossing over into the realm of the esoteric garagiste. 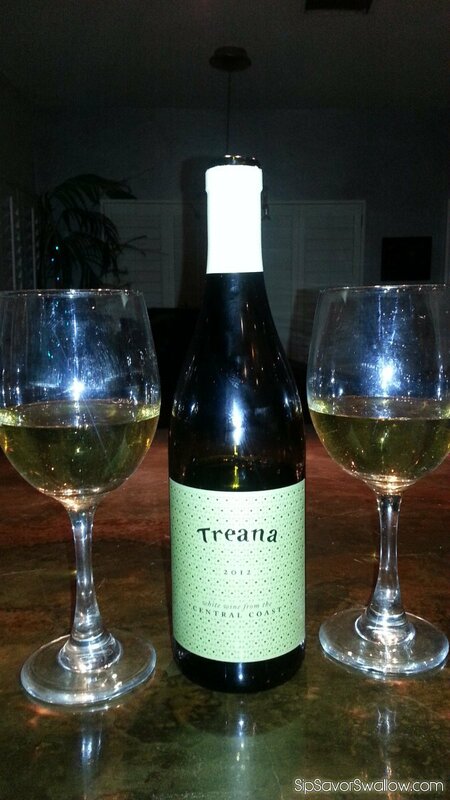 2012 Treana white is a 50/50 blend of Viognier and Marsanne, common enough in Rhone but still unusual in California. On the nose are stone fruits and florals (honeysuckle, jasmine) while the palate offers a luscious blend of dried apricot, Japanese plum, honeydew and nutty wood, finishing with subtle acids. 14.5% abv. 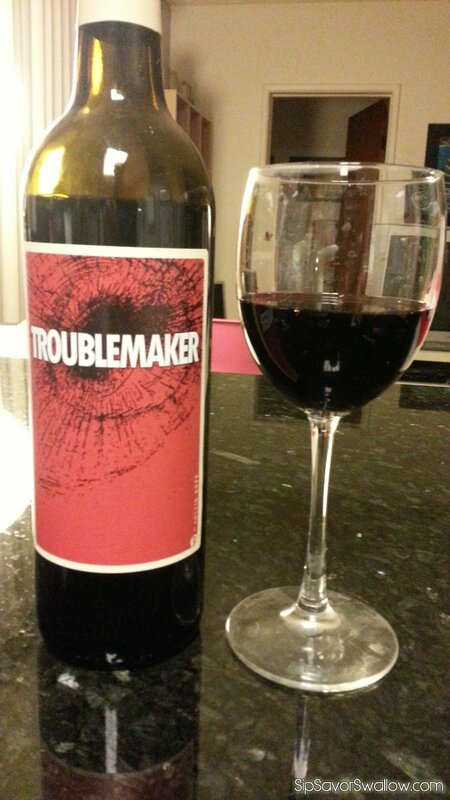 Troublemaker (NV) builds on a Southern Rhone archetype, blending Central Coast Syrah, Grenache and Mourvedre, finishing with 11% Zinfandel which lends the thing some definite zip. The non-vintage blend offers some surprisingly subtle structure, supple tannins, notes of ripe black cherries and a dusting of cigar ash on the nose, followed by the same, with plum, pomegranate, bakers chocolate, and a long finish of cedar and licorice . My Valentine and I made fast work of the Treana; I have every confidence the Troublemaker will be similarly completed before long. Creating blends at this price point in the California marketplace, where variety leads over regional tradition, takes guts: the implication is that a blend is a 'leftover' wine rather than a 'reserve' (that much over-used term that tries to take the place of a Cru in New World). Nothing could be farther than true for Treana and Troublemaker, both good values at around $20.